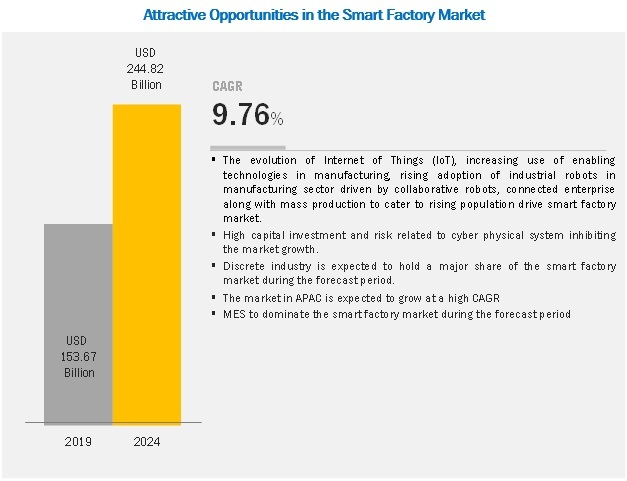 [188 Pages Report] The smart factory market is expected to be valued at USD 153.7 billion in 2019, growing at a CAGR of 9.76% during 2019–2024. The growth of this market is propelled by the evolution of the Internet of Things (IoT), increasing use of enabling technologies in manufacturing, rising adoption of industrial robots in manufacturing sector driven by collaborative robots, and connected enterprise, along with mass production to cater to rising population. Market for industrial robots is expected to account for the highest share of the global smart factory market during the forecast period. Implementing industrial robotics in smart manufacturing processes can improve productivity, reduce human errors, and increase production volume. 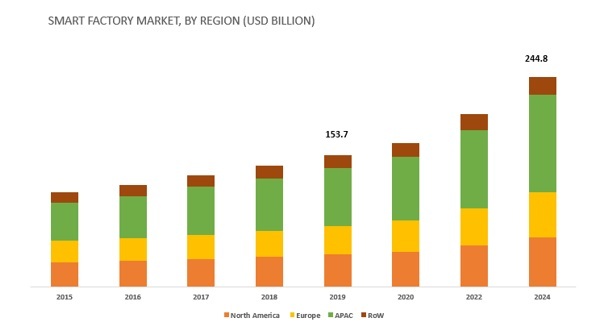 However, market for industrial 3D printing is expected to witness the highest CAGR between 2019 and 2024 owing to increasing adoption of 3D printing technology in various processes and discrete industries, such as automotive, aerospace and defense, food & beverages, and semiconductor and electronics. Market for automotive industry is expected to account for the highest share of the global smart factory market during the forecast period. Smart factory solutions play a key role in the development and production of quality automobiles. Innovations in assembly line methods are welcomed by vehicle manufacturers to enhance quality and increase factory productivity. Furthermore, in the process industry, the adoption of smart factory related technologies and components is expected to be the highest in the oil & gas industry because of the increasing need for safety and reliability in oil and gas plants. Companies operating in the oil and gas industry are always looking for new ways to meet rising demand for energy, cut operating cost, and enhance the overall efficiency of plants. Among all regions, APAC is expected to account for the largest share of the smart factory market in 2019. APAC is to hold the highest market share in the smart factory market due to technological innovation and increasing adoption of automation technologies in various industries. Prominent players in the smart factory market are Mitsubishi Electric (Japan), Omron (Japan), Yokogawa (Japan), and Fanuc (Japan). China has been working on an innovative industrial practice by implementing automation technologies in manufacturing. In addition, research institutes and corporates are collaboratively working to improve manufacturing processes in China. Further, in China, industrial intellectualization and information integration remain the main focus of the government industrial policy. This initiative is expected to increase the demand for smart factory solutions in this country. Toyota (Japan), Honda (Japan), and Suzuki (Japan) are developing smart factories for manufacturing robots, sensors, wireless technologies, and machine vision systems. This demand is propelling the growth of the smart factory market in Japan. Key players that offer solutions related to the smart factory market are ABB (Switzerland), Emerson Electric (US), FANUC (Japan) General Electric (US), Honeywell International (US), Mitsubishi Electric (Japan), Robert Bosch (Germany), Rockwell Automation (US), Schneider Electric (France), Siemens (Germany), and Yokogawa Electric (Japan). Siemens is one of the leaders in the automation industry, and it is one of the important players in the smart factory market. Its strong technical expertise and brand image help the company gain a clear competitive edge in oil & gas, petrochemicals, and chemicals industries, among others, and in major geographies. This also helps the company create a vertically integrated business model centered on developing devices with innovative features. General Electric is one of the leading providers of industrial automation solutions to various process and discrete industries. GE’s Intelligent Platform business division offers hardware and software technology platforms with a strong focus on selling through solution providers. The company aims to renovate itself as a “Digital Industrial” company to increase its share in the global smart factory market. ABB is one of the largest conglomerates in the world with a well-established track record in power and automation industries. The growth of the company is mainly driven by its organic growth initiatives and focused investments in innovations, customer services, and sales. The company spent a significant amount of its revenue for its research and development in 2017 as compared to 2016, which will help it for exploring more in the smart factory market. In June 2018, PTC Inc. (NASDAQ: PTC) and Rockwell Automation, Inc. (NYSE: ROK) today announced that they have entered into a definitive agreement for a strategic partnership that is expected to accelerate growth for both companies and enable them to be the partner of choice for customers around the world who want to transform their physical operations with digital technology. As part of the partnership, Rockwell Automation will make a $1 billion equity investment in PTC. PTC and Rockwell Automation have agreed to align their respective smart factory technologies and combine PTC’s award-winning ThingWorx ® IoT, Kepware ® industrial connectivity, and Vuforia ® augmented reality (AR) platforms with Rockwell Automation’s best-in-class FactoryTalk ® MES, FactoryTalk Analytics, and Industrial Automation platforms. In May 2018, Schneider Electric, partnering with Temasek, has reached an agreement to buy Larsen & Toubro’s Electrical & Automation business and will combine it with its Low Voltage & Industrial Automation Products business in India. In April 2017, ABB and IBM entered into a partnership for industrial artificial intelligence solutions. ABB Ability and IBM Watson Internet of Things (IoT) is a powerful automation combination that helps to improve the production lines by identifying critical faults during manufacturing process. Which component of smart factory would have the highest demand in future? Smart factory solutions are most preferred in which industries? What are the opportunities and challenges for the smart factory market? What are key industry trends in the smart factory market? What is the impact of 5G on the smart factory market? The study involved 4 major activities to estimate the current size of the smart factory market. Exhaustive secondary research was done to collect information on market, peer market, and parent market. The next step was to validate these findings, assumptions, and sizing with industry experts across value chain through primary research. Both top-down and bottom-up approaches were employed to estimate the complete market size. Thereafter, market breakdown and data triangulation were used to estimate the market size of segments and subsegments. In the secondary research process, various secondary sources such as Factiva and Avention have been referred to, so as to identify and collect information for this study. These secondary sources included annual reports, press releases & investor presentations of companies, white papers, certified publications, articles by recognized authors, regulatory bodies, trade directories, and databases. Extensive primary research has been conducted after gaining knowledge about the smart factory scenario through secondary research. Several primary interviews have been conducted with market experts from both demand and supply sides across 4 major regions North America, Europe, APAC, and RoW. Approximately 30% and 70% primary interviews have been conducted with parties from the demand and supply sides, respectively. These primary data have been collected through questionnaires, e-mails, and telephonic interviews. Both top-down and bottom-up approaches have been used to estimate and validate the size of the global smart factory market and other dependent submarkets. 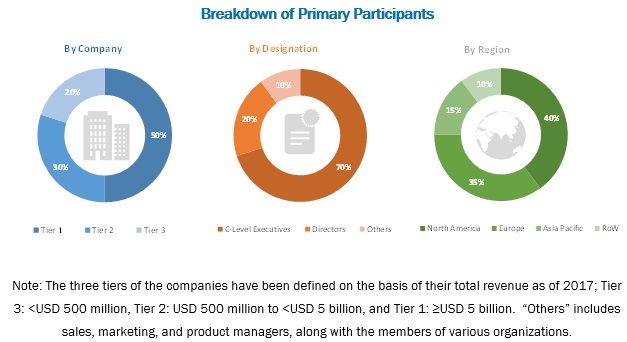 Key players in the market have been identified through secondary research, and their market rankings in the respective regions have been determined through primary and secondary research. This entire research methodology involves the study of annual and financial reports of top players and interviews with industry experts (such as CEOs, VPs, directors, and marketing executives) for key insights (both quantitative and qualitative) on the smart factory market. All percentage shares, splits, and breakdowns have been determined using secondary sources and verified through primary sources. All the possible parameters that affect the markets covered in this research study have been accounted for, viewed in detail, verified through primary research, and analyzed to obtain the final quantitative and qualitative data. These data have been consolidated and supplemented with detailed inputs and analysis from MarketsandMarkets and presented in this report. After arriving at the overall market size from the estimation process explained above, the total market has been split into several segments and subsegments. To complete the overall market engineering process and arrive at the exact statistics for all the segments, the market breakdown and data triangulation procedures have been employed wherever applicable. The data have been triangulated by studying various factors and trends from both demand and supply sides. The market has also been validated using both top-down and bottom-up approaches. To analyze strategic developments such as joint ventures, mergers and acquisitions, new product developments, and R&D in the smart factory. In this report, the overall smart factory market has been segmented on the basis of components, technologies, industry, and geography.